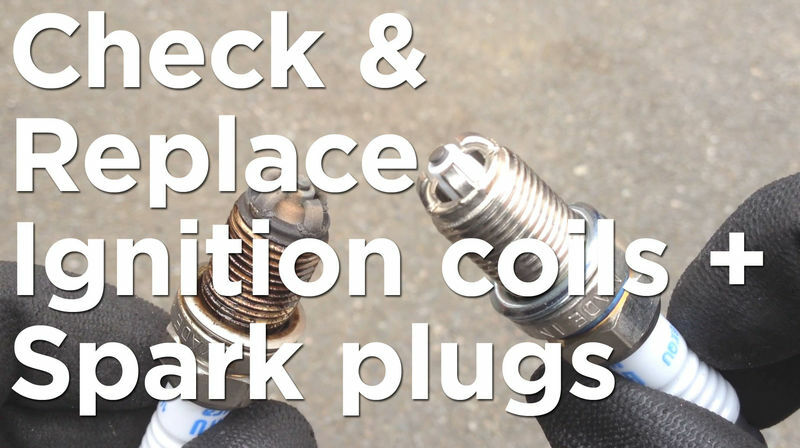 An ignition coil is an induction coil that transform the low voltage from the battery to the high voltage needed for the spark plugs. On the Boxster these are exposed to the elements so it’s prudent to check them for hairline cracks. As it’s very little additional effort and because spark plugs are cheap I’ll replace all six whilst I’m there. 1. So safety first we’ll disable the ignition system as that reduces the risk of any electrical shock. Open the boot, pull back the carpet and slide out the relay box. Pull out the ignition relay as shown. 2. Raise the car and remove the rear wheels. Click the Suggestion box at the top to see my How To guides from Series 1. 3. Remove the plastic cowling. It’s held on with two 10mm nuts. 4. Here are the first 3 ignition coils. 5. We need to remove the electrical connection to the coil so pull back the plastic shroud and unclip the connector. 6. Using a ratchet and 5 mil hex bit unscrew both screws. Access is a bit tight on the top screw so you’ll need a small ratchet. 7. Pull out the coil. 8. Inspect the coil and replace if there are any cracks. Some like this one are hairline and hard to spot. Some, like this, are more obvious. On my 15 year old Boxster all 6 coils had cracks - 4 with hairline cracks and 2 with larger cracks. 9. Now, using a 16mm deep socket remove the spark plug. If the plug doesn’t come out inside the socket then use a magnet to grab it. You can also use the magnet if the socket comes off the ratchet. 10. Here’s a new spark plug next to the old one. You can see a small amount of build up on the plug. 11. Insert the new plug and torque to 30 Nm. 12. Insert the new coil, screw in both screws and attach the electrical connector back. The new coils use different screws. These are e11 star type. 13. Repeat on the remaining 5 coils and spark plugs. 14. Once finished replace the plastic cowlings, pop the ignition relay back in, push the relay box back and re-fit the carpet. 15. Finally, put the wheels back on, lower the car and go for a test drive. First let me say I admire you taking the time to produce these videos! I was cringing watching the video as I could see the oil squishing as you were loosening the plug. Thanks for spotting the leaking coil seals. Something to add to my list to replace! I'll put a note on the video to advise people.